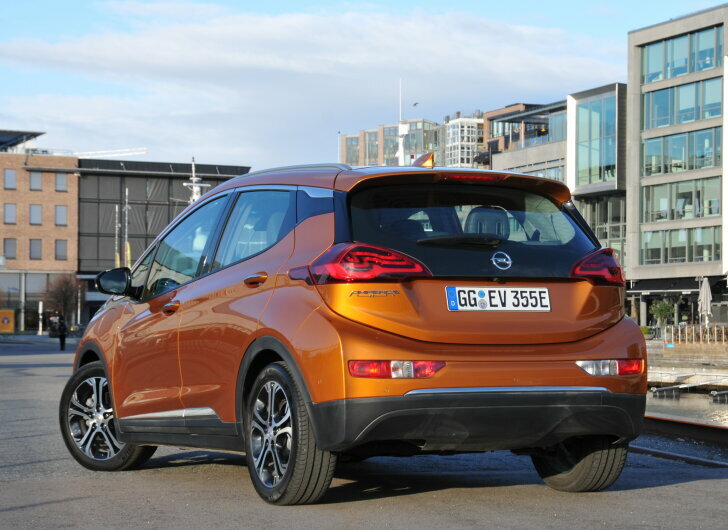 Review | Electric cars are for environmentalists and cheapskates. At least, that's the prevailing opinion. By improving technology and eliminating the last objections against electric cars, Vauxhall wants to make the electric car as common as a petrol or diesel vehicle. Did they succeed? The "Ampera-e" is the second generation of the Vauxhall Ampera. The first Ampera was a large sedan, which made it obvious it was aimed mainly at businesses who used to cut taxes. According to Vauxhall, the electric car is now ready for the general public and that's why the new Ampera-e is a compact yet spacious family hatchback. Because the Ampera-e has been designed as an electric car from the start (it's not an existing model that has been adapted later), the cabin space could be utilised to the fullest. The batteries are mounted underneath the vehicle and therefore the boot is as large as with other cars of this size. 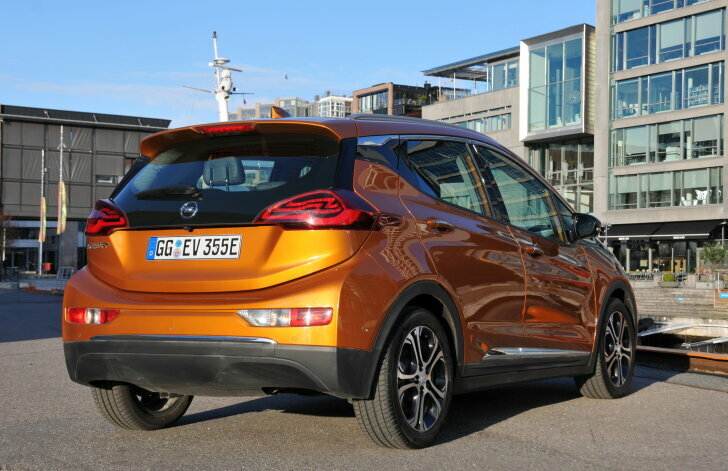 But... because an electric motor takes less space than an internal combustion engine, the engine bay is smaller and even more cabin space remains. As a result the head and legroom in the front are huge! The seating is a bit higher than average, for easy entry and a good view over traffic. Thanks to a set-up with so-called "thin" seats, there's also ample space in the rear. Even adults sit comfortably on the back seat. One drawback of this construction is that Vauxhall's famous seats from the "German society for healthy backs" are not available on the Ampera-e. 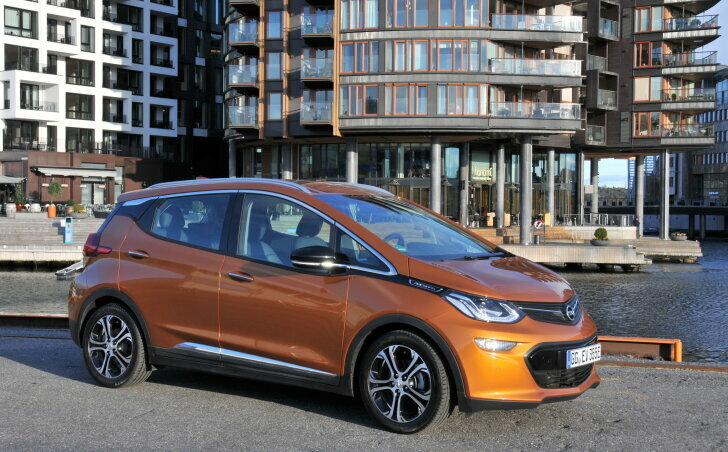 The Vauxhall Ampera-e has been developed in cooperation with the American brand Chevrolet, which sells the car under the name "Bolt" on its home market. The upside of working together is that the car could be developed quickly at a relatively low price. The downside is that the build quality and quality of the materials used are well below European standards. Also, hallmark Vauxhall technologies are only available in "light" versions. 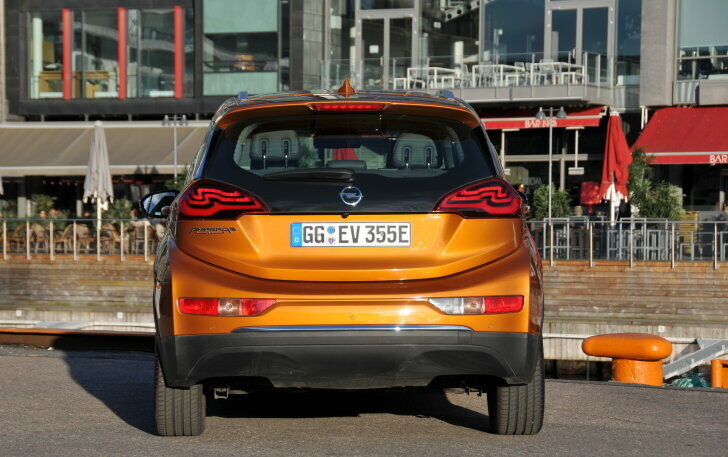 For example, the Vauxhall Ampera-e can operate the high beam automatically without blinding oncoming traffic, but this system isn't as advanced (xenon instead of LED) as that of the new Astra. "OnStar" is an assistant (a person, not a computer) to help plan routes or call for rescue in case of emergency. However, because the Ampera-e doesn't have built-in satnav, OnStar is less effective. To navigate, the Ampera-e relies on a smartphone running either Apple CarPlay or Android Auto. As usual with Vauxhall, the "Vauxhall Eye" is available. This all-seeing eye scans for danger and will warn the driver or even activate the brakes if necessary. The Vauxhall Ampera-e is meant to be a normal car, not a toy for tech lovers. Those who want to, can get an insight into the inner workings of the electric drive line, but one can blissfully ignore this without any consequences. Yet, there are some differences with conventional cars. For example, there's no rev counter but instead a gauge that shows how much current is being drawn. Instead of a fuel gauge, there's a battery gauge that also shows the remaining range. Limited range is the weak point of electric cars and the main reason why driving electrically hasn't caught on with a large audience. Up to now, affordable electric cars could cover 150 to 200 km (90 to 125 miles) on a full battery. Only very costly cars could do 400 km (250 miles). Vauxhall finally solves this problem, because the Amerpa-e can cover 520 km (323 miles) on a full battery (charged either at home or at a public charging station) and that's comparable to the range of the average petrol car. Do note that this 520 km is a theoretical value (NEDC norm) which is used to compare the range of various electric cars. In real life the Ampera-e can cover 300 to 400 km (185 to 250 miles) fully charged. This depends on the driving style, weather conditions and use of accessories (heater / air con). On a long test drive with a sporty driving style, the test car covered 320 km. An economy run with a calm and fluent driving style without use of the climate control lasted 400 km until the batteries finally gave up. Just like any other electric car, the Ampera-e can regenerate energy while driving. What makes the Ampera-e special is that the driver can choose how much energy is being recuperated. The Ampera-e can simply coast when releasing the throttle (maximum distance), slow down a little (charge a little) or slow down so much that it feels like hitting the brakes (charge a lot). By using these possibilities wisely, one can extend the range by tens of kilometres. Because the test driver never suffered from so-called "range anxiety", the car could be enjoyed to the fullest. And just like with every other electric car, the drive is far superior to that of any conventional competitor with a similar price tag. From the very first moment, the electric motor is able to deliver its full power, while an internal combustion engine first has to rev up to perform. Therefore, the Ampera-e is more refined and quiet (except for the tyres) than any petrol or diesel car. Even better: driving the Ampera-e gives the driver the privileged and relaxed feeling that is usually associated with big limousines. At the same time, this compact Vauxhall can be fierce and fast. Even when all ready at high speed, acceleration is impressive; the Ampera-e goes from 80 to 120 km/h quicker than a Vauxhall Astra OPC! The underpinning is firm (tuned for the European market), while the enormous weight of the batteries (430 kg) presses so hard on the suspension that it ends up being very comfortable and well balanced. This gives a reassuring feeling in the steering wheel and an altogther good feeling about handling. Handling is excellent and thanks to the good balance between the suspension, tyres and steering the Ampera-e feels less like a heavy weight than other electric cars. Even in this respect the Ampera-e is ready for the general public. Prepare to go for your last drop of petrol or diesel! Does the Vauxhall Ampera-e make driving an electric car as common as driving a petrol or diesel car? Yes, without a doubt. The Vauxhall Ampera takes away the last arguments against driving an electric car. The range and price are comparable to those of a petrol car and that means an end to the limited use of electric cars. On top of that the Vauxhall Ampera-e is simply better to drive than traditional cars. The Ampera-e is quick, quiet, agile and comfortable. Also, the Ampera-e is spacious, luxurious and safe. In short: the Vauxhall Ampera-e is the so-called last drop that was necessary to say farewell to the internal combustion engine. 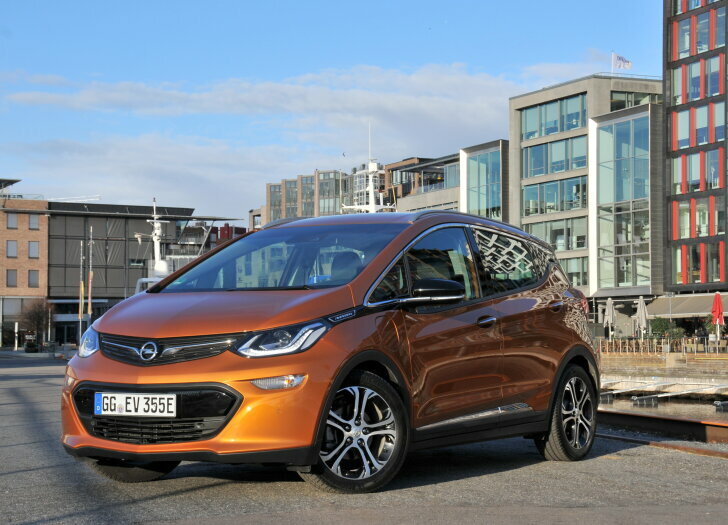 With the introduction of the Vauxhall Ampera-e, driving an electric car will be as common as driving a petrol or diesel car.